School's Out and Surf's Up with LEGO Friends! School’s out and the summer holidays are finally here so what could be better than celebrating its arrival with Disney channels latest blockbuster, ‘Teen Beach Movie’, sponsored by LEGO Friends. Set in Puerto Rico, the movie is set to be a summer smash hit with kids, young and old, sure to be singing and dancing along to the infectious songs and dance routines. Featuring hot new stars, Ross Lynch and Maia Mitchell, the story centers on the main characters and their mutual favorite beach musical film, set in the 1960's. As part of the LEGO Friends partnership with the movie, Strictly Come Dancing’s Kristina Rihanoff has joined the LEGO Friends musical flash mob on Brighton Pier to dance to Surfs Up!, the signature song from The Disney Channels newest film. The routine has been performed to celebrate the start of the school summer holidays, as families flocked to Brighton for the summer break. 100 young girls aged 10-12, all recruited from theatre arts school, Stagecoach delighted passersby with a polished overwhelming performance that led to members of the public joining in with the fun and giving the routine a go! To ensure the fun was captured for all to see, LEGO Friends have produced a video of the Lego Friends flash mob. To find out more about LEGO Friends visit www.legofriends.co.uk. 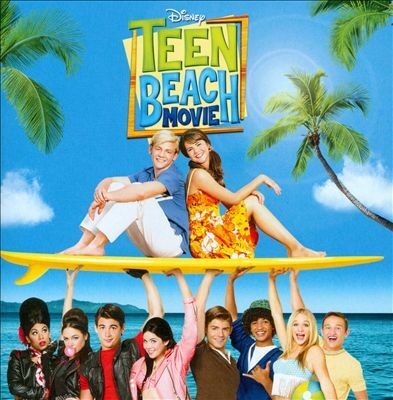 Teen Beach Movie Soundtrack review. For weeks the girls have been going on about the latest Disney Movie that was being premiered on Disney Channel on 19th July 2013. I had to laugh as it took me back in time when the eldest daughter had exactly the same reaction to High School Musical, so when they were given the opportunity to review the actual soundtrack, they were just a little bit excited!! Before the movie was even aired I knew that the girls would like it as they are huge Austin and Ally fans, so the fact that Ross Lynch was starring was guaranteed to be a winner. I am guessing from the fact that the CD has been blaring out from Neva's bedroom for the past week that it has been a success, and Xene has been demanded to download the songs onto Eowyn's MP3 player means that it has certainly got her interest too. Eowyn loves Can't Stop Singing and Neva's favourite is Cruisin for A Bruisin. Since Xene was given two Schleich animals for her first birthday, fourteen years ago, our household has been keen Schleich fans. I also love that Schleich is in Schwabisch Gmund, which is the twin town of Barnsley, South Yorkshire where I grew up and also where I spent a couple of exchange programmes, whilst at school. So, when we were given the opportunity to review their new range of Knights, I knew this would be perfect for at least three of the children, although I have to say I have seen all of the children pick them up and pretend play with their siblings, which is always a good sign! Schleich are bringing a whole new concept of knights to the market this year. Rather than the clichéd battle against good & evil, powerful dragon knights will be throwing the gauntlet down to the wise order of griffins. Shimmering armour, flowing capes, fearsome expressions, the new band of knights lining up for action from July 2013 look suitably ferocious. Tyrus was very keen to get them out of the packet! As usual, fantastic quality and craftsmanship from the Schleich people, the Knights have all of their correct body detail, the horse is sturdy and even Tyrus aged 2 can place the Knight on the horse without any trouble. 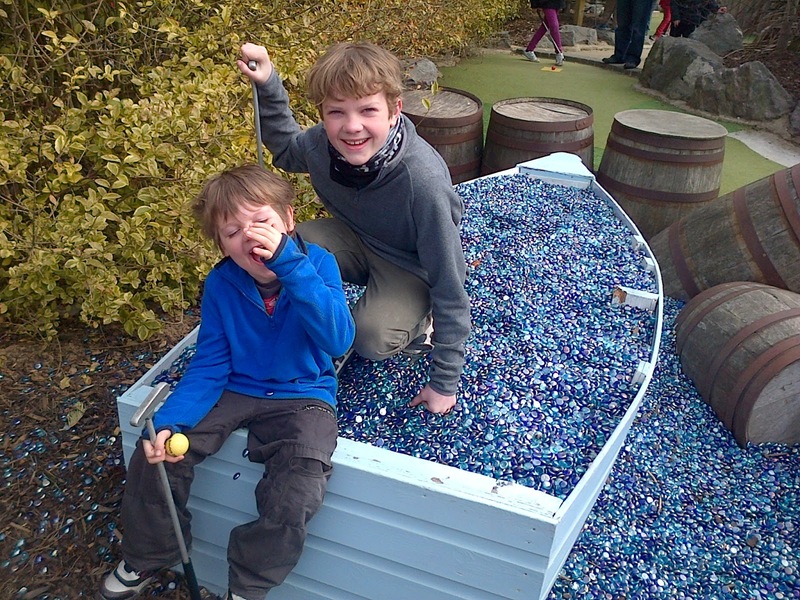 There are no sharp edges making them a perfect play piece for the younger children too. The extra large footplate on the Knights means that they are able to stand on almost any surface and the boys don't get frustrated because they fall over. There is lots of scope for pretend play and all of the children have enjoyed playing with them, as well as daddy too. If you are looking for a good, sturdy Knights playset that will last a long time, then these boys are definitely for you. There are more to collect in the series and of course the Griffens too. It kept them amused for hours! Not only does Butlins have a fantastic entertainments programme throughout the day, but the entire place is alive at night too. Having a varied age range of children, there was something for everyone. The girls were very keen to see the Katy Perry tribute Show and Eowyn spent all evening singing and dancing along to the songs, although it was extremely busy and almost impossible to find a seat, so my recommendation would be to get there early!! It was a very professional show and very popular with the audience. One evening had a show called Stars from the X factor, so we went along as we were curious how up to date the acts would be. On arrival at the Show Bar we were met with a sign telling us that the bar was full to capacity and they were unable to let anyone else in, which was the first time we had witnessed this, during our stay, so we guessed it must be someone quite popular! The attendant on the door was very apologetic to the people that were still queuing and she did tell everyone in the line that the act would in fact be appearing in the Reds Bar a short distance away in an hour's time, if we would like to make our way over there. This show was not publicised, but the act had agreed to do an extra show in order that all of the people unable to see the first show, could also see it, this was yet another example of Butlins going the extra mile for their guests and proves that they certainly do offer a first class service. The Reds Bar was very impressive, the only negative with it is that everything takes place upstairs, so to access it with the pushchair, you had to use the lift, which was fine on the way up, but after the show had finished a rather large queue formed, when all of the pushchairs and wheelchairs needed to exit, and there is only one lift! As you can see the Reds bar was also extremely busy and there was standing room only. I have to say I am not really a fan, but he did put on a very good 45 minute show, which went down a storm with the entire audience. There are many other things to amuse you during the evening, all of the amusement arcades are open and there are films showing at the cinema. Everywhere is nicely lit, meaning that a simple stroll was also just as nice, away from the noise and entertainment. Decision Made! ITS GOING TO BE A WATERBIRTH. After my post about my birth choices, I had some lovely comments and conversations on Twitter, with lots of mums experiencing fabulous water births. On closer inspection of their website I fell in love with the Pool, not only is it heated throughout the entire rental, it has a lid that can be locked to prevent late night swims from the children! 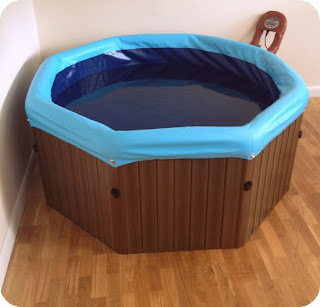 They have a five week rental, which they deliver at 37 weeks, so I have my pool being delivered on 14th August and to say I am a little excited is an understatement! So now UI am just counting down these very hot sticky days until they deliver the pool. The website says that it is extremely easy to erect, so I hope they are correct, look out for my video of Asa and I trying to put it together, this could be worth a watch!! Log on to our live interactive WebTV show where Spelbound will take you around the opening of the Butlins Splash Waterworld in Skegness and have a sneak preview of the nation’s newest and most exciting waterpark. We spent a HUGE amount of our Butlins break in the various pools, all six children absolutely adored it, there was so much choice and activities to do, from the Lazy River to the Water Slides, the wave machine to the Rapids, there really is something for everyone to do. 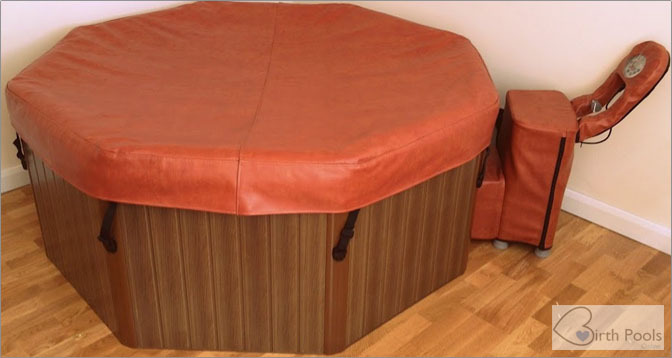 ChillFactor The perfect Answer for these hot days! It’s hot, hot, hot, but not as hot as ChillFactor! Kids’ toy slushy maker sells out in many stores as temperature soars! ChillFactor™ went on sale in late May and is almost certainly to be one of the top “toys” of the year and retailers such as Smyths Toys, Amazon and Argos are having stock delivered airfreight to keep up with consumer requests. Now, with the weather supposedly remaining hot for the upcoming weeks ahead, Character Options certainly has a task ahead. First gNappies Video So Cute! gNappies invited gMums from all over the UK for a gTea at Orleans Park Gallery Gardens by the Thames. Videoing for posterity, the first gVideo was born. No, I have not given birth early, although with this heat, a few days early would be very welcome! As I am about to embark on being a mummy of seven, I began reflecting on the different pushchairs and car seats I have had over the past 15 years, many of them have been Britax products and I really do love them, so I guess you could say this is my dream company to promote! Britax is one of the world's leading manufacturers of travel solutions for children, with an impeccable reputation of creating safe and stylish products for families, including car seats, pushchairs, travel systems and more. 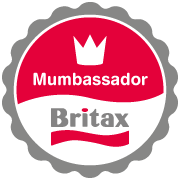 As a Mumbassador I will be able to bring you the latest news and tips from Britax and with the other Mumbassadors bring you some honest reviews on their latest products, with some input from the big kids, who always have something to say!! There will also be the chance for you to enter competitions and to ask the Britax safety team your burning questions. You can follow @BritaxUK on twitter and find them on Facebook here. I met some of the wonderful Britax team at Brit Mums, who were very knowledgeable and passionate about their products. So keep an eye out in the not too distant future for some more Britax posts. Don't do it just because your baby's feet are pushed against the car's back seat. 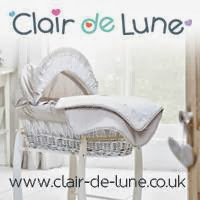 The law requires all children to travel in an appropriate child restraint until they reach 135 cm tall or their 12th birthday (UK, NL, DEN) or 150 cm tall or their 12th birthday (GER, AU, CH, IT, CZ) – whichever comes first. It is the driver's responsibility to ensure this is the case. Bababsling Winner Is It You ? Thankyou to everyone that took part in the Keep Britain Breastfeeding Scavenger Hunt, and for all the support and comments I have received throughout. Congratulations, please send me your details to mandijmorrison@aol.com and I shall pass them onto the company. As a large family, going out for an evening is quite an expense, just as finding a babysitter so that Asa and I can go out is also expensive, before we start!! So when MoneySupermarket challenged Bloggers to have a big night in with £50 to spend, we all sat down to discuss what we should spend the money on!! The children are never all asleep until 11pm, I am 32 weeks pregnant with constant heartburn and it wouldn't be a family night! The weather has finally started to resemble summer, much to the disgust of my ever expanding bump, but good for everyone else!! Therefore, something in the garden was the favourite choice. The two things the children enjoy doing in the hot weather is splashing in the paddling pool and having a barbecue, so we decided to combine the two. A Pool Party and Barbecue. As you can see, they all had a wonderful time, and it was great to spend an evening as a family, I am pleased to say it also wore them out, and every one of them went up to bed without any fuss and quickly fell to sleep! - Check the weather forecast before attempting outside activities. - Be resourceful, the paddling pool will now be used all summer. And above all HAVE FUN ! 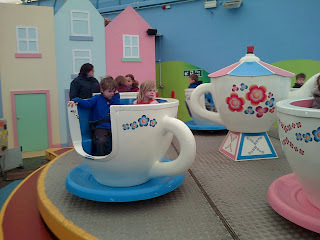 All six children had a wonderful time during our stay at Butlins, there were so many activities available it was quite overwhelming at the beginning. You will never hear the words "I'm Bored"
Dotted throughout the park were lots of statues and structures that all of the children HAD to climb on!! There were various photo opportunities throughout the entire park, this waa by far their favourite and looking on the Butlins website, this is popular family photo, although our whole family would have had a little bit of trouble fitting!! A very large sweet shop, that we visited before our journey home to buy each child a small treat and to get something for the grandparents, to say thankyou for looking after the rabbit and chickens whilst we were away!! There was a very tasty milkshake bar, that the girls and Tyrus sampled whilst Asa, Kaide and Lochlan played Crazy golf, sshh don't tell them!! There are numerous coin operated rides throughout the complex, although the girls did just seem to enjoy sitting in them and having their photo taken!! All of them enjoyed the Giant Beach and a perfect place to play Hide and Seek, and just a short hop from the real beach!! There are various Play Areas both indoor and out, for all different ages, all of the children loved to run off steam, and the big ones were able to supervise the little ones, which meant I didn't have to squeeze my expanding belly into any small spaces! 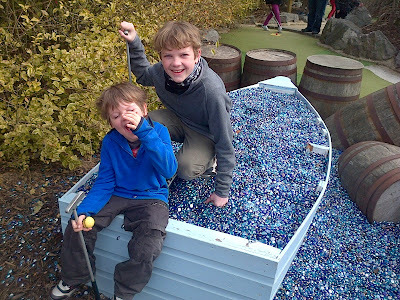 The boys really enjoyed having `boy time' with dad playing Crazy Golf, made even better by the fact that Lochlan won a free game of golf, by completing a challenge on the last hole. All of the activities were great and the children loved them all, however their highlight of the entire holiday was the Splash Waterworld, which we all went in nearly every day, for at least a couple of hours!! Every single child loved it for different reasons, because there were so many different pools and activities, it really did cater for ages 2 to 15. Neva adored the Lazy River, that pushed you around, with various spouting water canons. Tyrus, Eowyn and Kaide loved the shallow pool that had small slides to go on, Tyrus became braver every time he went on it and ended up sliding backwards at one point!! Xene and Lochlan went on the large water chutes with dad, although the queue was quite long they said it was worth the wait. The wave machine pool was a huge hit with all of them, especially when the lifeguards threw numerous inflatable toys and balls in to liven it up!! 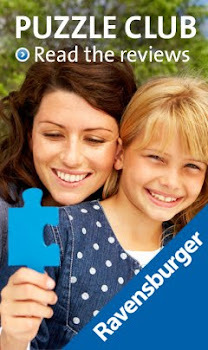 As part of the Ravensburger Puzzle Club we were sent Big Ben 3D puzzle for the whole family to enjoy. It has a recommended age of 10-99. To begin with Neva and I sorted the pieces numbered 1-100, whilst Asa began assembling them. Lochlan and Kaide sorted from 101-216. We had previously constructed the Eiffel Tower, so we sort of knew how the pieces fitted together, although the children struggled to fold the corner pieces, so that was my job! The only part that Asa struggled with was the top, not because it was particularly difficult, but because his hands were too large to fit inside the pointy top! Thankfully the smaller handed people were there to give a hand. As you can see, Kaide and Neva were very pleased with themselves when the puzzle was completed. The puzzle was quite easy to construct and it didn't take very long, the 3D element, certainly kept the children's interest and it was a real family activity. Less Than Ten Weeks To Go! Waterbirth Anyone ?